Foundation is one of the hardest things for me to buy in the drugstore. That’s why when I find one that works, I pretty much stick to it until it’s discontinued.The main struggle of finding the perfect drugstore foundation is shade matching. Without testers, we are left to hold the bottle up to our faces and check our reflection in our front-facing camera phones to compare shades (what… that’s only me?). 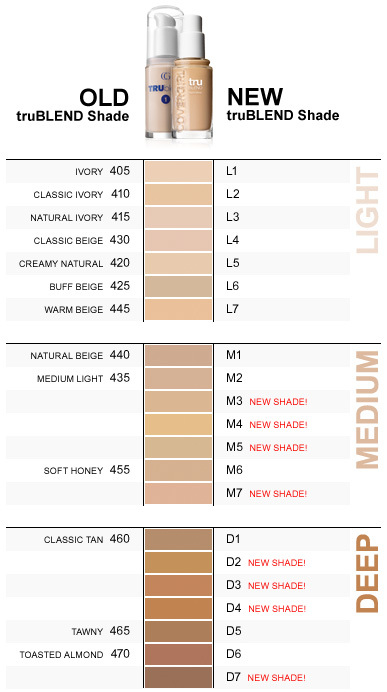 On top of that, many drugstore foundations don’t have a large selection of skin shades to choose from in the first place. 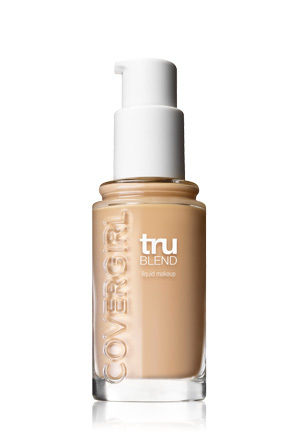 CoverGirl has completely re-vamped their truBLEND foundation and concealer shade matching system for 2014. With 21 shades, 8 of them being new, the brand claims the system will match 99% of women. Shades are broken up into 3 shade families: Light, Medium, and Deep. There are seven different shades within each family, with a mix of warm, cool and neutral tones. The numbers don’t necessarily move from lightest to darkest. The composition of truBLEND foundations has also received a makeover, with a new water-based formula. This is something I’m glad to hear; when I tested the old formula early last year, it was thicker than what I was used to and hard to blend. Luckily, the convenient pump packaging has been carried over with a label redesign. CoverGirl has also released the new truBLEND FixStick Concealers, which follow the new shade system as well. However, there is not one pencil per shade, but two pencils per shade family (6 pencils total). The pencils are split up into shades 1-4 and 5-7 from each family. The new shade system has not affected the truBLEND powders, and there aren’t any signs that they will adopt the changes. I’m very interested to hear what long-time wearers of the truBLEND foundation think of the formula and shade system change. 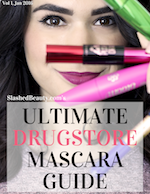 It’s refreshing to see a drugstore brand include so many different skin shades in their line. Now it’s a matter of local retailers actually stocking the entire collection. Do you think the new system is easy to navigate, or overwhelming? I have used Cover Girl for many years and people always ask me what foundation I use. Now that the bottles have changed I have no idea what to buy. I use medium light and bought the Clean for normal skin. It feels different from my old formula which came in a sort of flat rectangular plastic bottle. HELP! Is it the triangle bottle you’re using now? I do believe that’s a completely different formula and they have the different finishes like matte, sensitive skin, etc. now i have no clue n my area does not have testers nor the card when trublend first came out. I’m just glad they have testers of these available! This has to help the people that use that foundation to be able to choose. It looks like the new system will be easier, once people get the hang of it. It appears to be more simple, which is usually good with the complicated nature of matching to skin. It’s always nice to see shade expansions, though I always seem to find myself in that group that can never find the right match. I’d like to give this a try this year, but the only displayer I’ve seen wasn’t the full range.. so hopefully I’ll come across it soon. Overwhelming! But I could see how it would be easy for people who already use the formula. I definitely want to try and get a match in this though! Reasons for me mot buying d/s foundy: (1) It’s the lack of testers (2) Granted there were some testers, those I’ve seen from my local CVS look gross and moldy, eeeek! It’s the lack of testers that stop me from buying plus I’ve never found a CG that was light enough. I have the hardest time trying to match myself! Hopefully this helps a bit! I always struggle to find the perfect color for my skin especially between seasons – but i love the idea of the fix stick concealer I’d really be interested to try it! They’re all too dark. I always try to match foundation to my neck / chest because of my rosacea in my cheeks. Foundation is so hard to match even with a system… This has a nice breakdown though, and looks like it’d be easy to figure out if someone was already a CG foundation user. Good to know they improved the formula, because I also had problems with blending their old foundation. I might give it a try, considering that L1 is a great match for my complexion. Foundation is so confusing! I just saw a Wayne Goss tutorial that said now we’re supposed to match foundation to our shoulders? One of these shades should work! I never understood the concept of matching foundation to other parts of our body. I know my face is naturally a different color than the rest of my body… but if I try to shade match with my shoulders it would be too dark and weird looking! I am curious to hear more about the new formulation, too! The system does seem a bit easier with the new numbering. I always struggle with finding shade that are ilght enough for me. At first glance, the system does seem a bit overwhelming, but I’m sure with more research, and seeing it in person, I could figure it out. Foundation and concealer are both so hard to find the right match for… sometimes even when you can use a tester! I tend to bring whatever foundation I am using currently that matches/or is close, and compare it to the other ones. This helps for the most part! Thanks for all of this great info!! 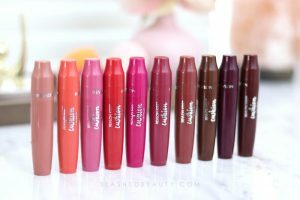 I have never tried the truBlend line but I like that they expanded the shades. I think it becomes easier to find a shade match every time I buy. When I first started with foundation I thought it would be impossible to find the right shade. Now I can do an “educated guess” that is usually decent.